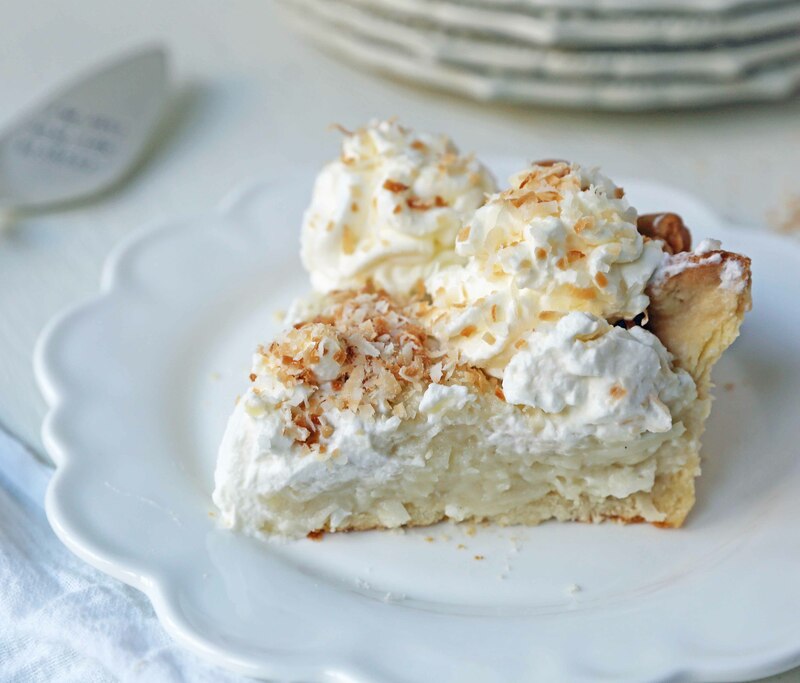 I was always the first to snag the coconut cream pie at Thanksgiving. My Grandma and Grandpa lived on Camelback Mountain so we would drive our station wagon up the steep mountain in anticipation of our annual Thanksgiving feast. Since all of my aunts and Grandma would make at least 2-4 pies each, we would end up with more pies than we could possibly eat. To a kid, it was the best looking spread ever! I would eye all of the pies and would choose my favorite. It usually involved coconut because it has been well established that I’ve been a fan of coconut since birth. Since Thanksgiving is literally around the corner, it was time to share my favorite coconut pie recipe. 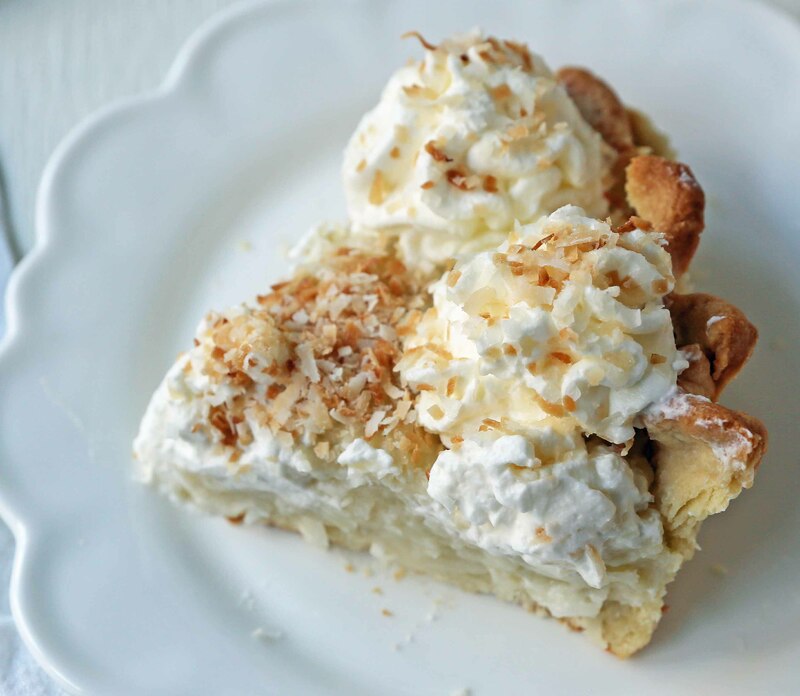 This is made with a homemade coconut cream custard and topped with fresh whipped cream and toasted coconut. Oh, and we can’t forget about the homemade buttery pie crust, either. Last year we headed to Seattle for our family summer vacation. It had been on our bucket list for forever and we couldn’t wait to experience green trees and water. We also had some highly recommended food places on the list to try. One of the most talked about restaurants in Seattle is called Dahlia Bakery. It is known for their coconut cream pie. Being the coconut lover I am, I beelined it straight to the bakery to see what the fuss was all about. It was perfection and I was hooked. I sought out their recipe and found it in their Dahlia Bakery Cookbook to recreate it at home. The homemade custard began with canned coconut milk, sweetened flaked coconut, and whole milk simmered. Sugar, eggs, vanilla, and flour were added and cooked to thicken the cream. After a few trials and testing, we tweaked a few things about the recipe. We found that adding 2 cups of sweetened flaked coconut was too much. We could still get the sweet coconut flavor by using only 1 cup of coconut instead. The coconut cream filling came out perfectly and firm enough to hold up when cutting slices from the pie. 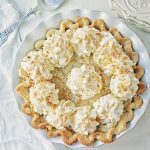 A homemade fluffy whipped cream is spread all over the coconut cream filling. 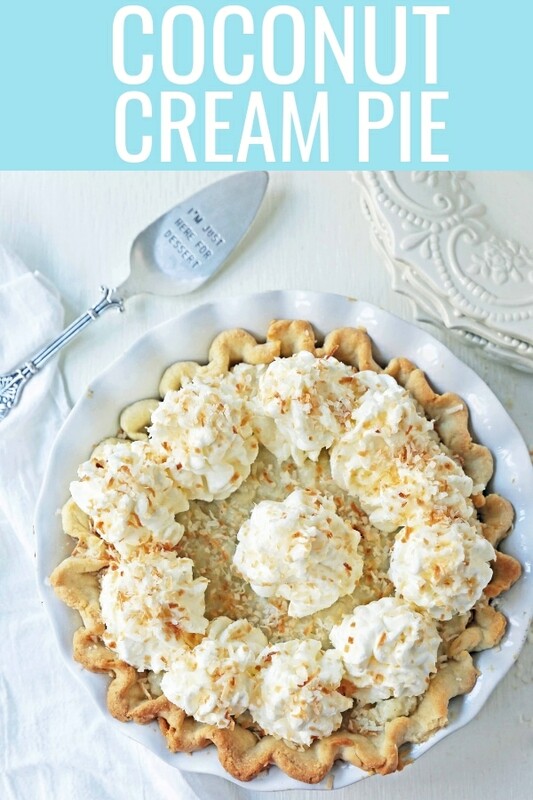 It becomes the perfect coconut cream pie! Start with simmering canned coconut milk, whole milk, and sweetened shredded coconut in a saucepan. The full-fat canned milk for the creamiest coconut cream pie filling. In another bowl, mix together eggs, egg yolk, sugar, and flour. The flour will act as a thickener so it is an important addition. You may also substitute cornstarch. Temper the egg mixture but adding only a small amount of hot milk mixture to the bowl. This will ensure the eggs don’t become scrambled eggs! By adding only a 1/4 cup of hot milk at a time, it slowly warms the egg mixture and prepares it to be added to the warm pot. Use a whisk to constantly stir the mixture while it thickens over medium-high heat. Once it is thickened, remove from heat and place in a bowl to chill. If you want to expedite the chilling process, fill a bowl with ice and place the bowl filled with coconut cream filling on top of the ice. 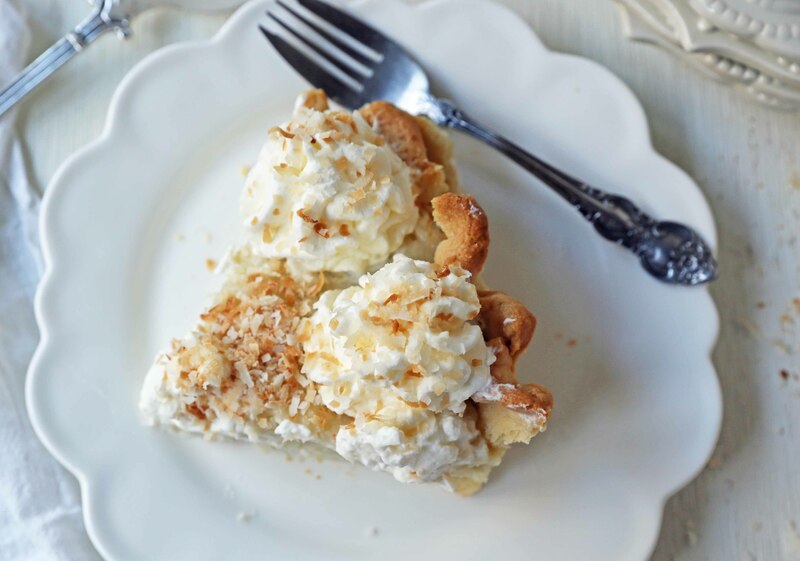 Coconut Cream Pie. 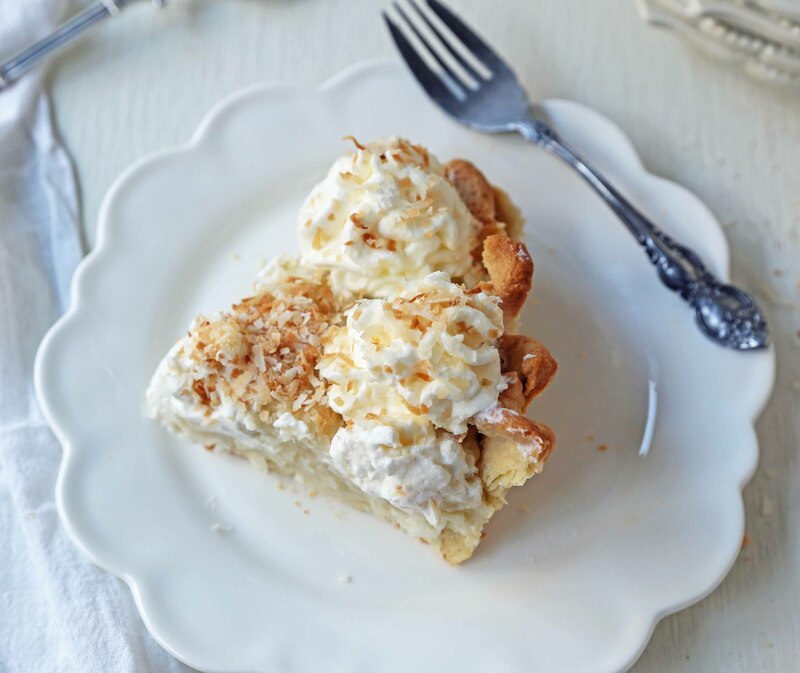 A homemade coconut custard filling in a buttery pie crust topped with fresh whipped cream and toasted coconut. In a heavy-bottomed saucepan, combine the canned coconut milk, whole milk, and shredded coconut. Place the saucepan over medium-high heat and stir until the mixture just begins to show signs of bubbling. In a medium bowl, stir together eggs, egg yolk, sugar, and flour until combined. Temper the eggs by adding 1/4 cup of hot milk mixture at a time to egg mixture, stirring after each addition. Whisk well. After you add it 3 times, add the warmed egg mixture into the saucepan with the coconut milk. Whisk over medium-high heat until the pastry cream begins to thicken and bubble. Keep whisking until the mixture is very thick, about 4-5 minutes more. Remove the saucepan from the heat. Add butter and vanilla and keep whisking until butter is melted. Transfer the pastry cream to a bowl and place it over another bowl filled with ice to expedite the chilling process. Place a piece of plastic wrap on top of the custard to prevent a film from forming and place in the refrigerator to chill. Let it chill long enough to become cold, about 1-2 hours. In a large mixing bowl, whip the heavy cream, powdered sugar, and vanilla until peaks form that is firm enough to hold their shape. 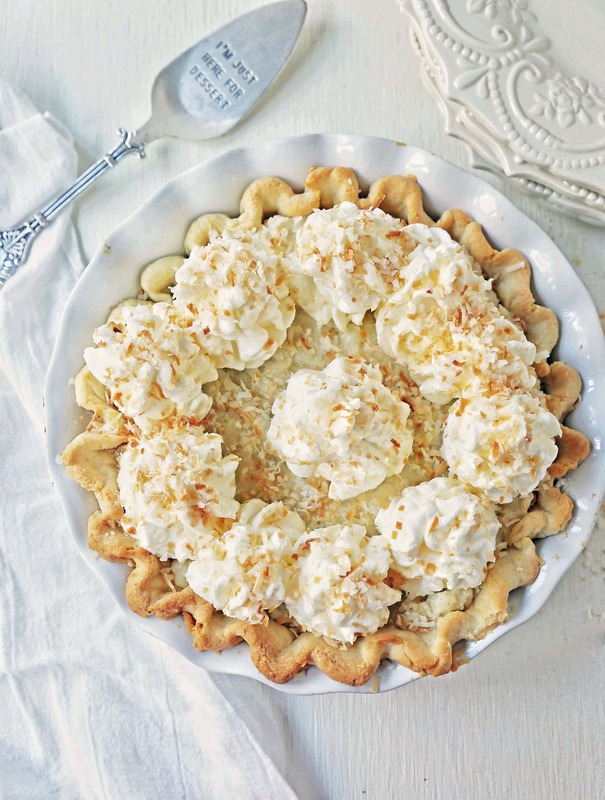 Take the pre-baked cooled pie crust and fill it with cooled coconut cream filling. Fill a pastry bag with whipped cream and pipe it over the pie. To toast coconut: bake at 350 degrees for 6-8 minutes or until light golden brown color. Sprinkle all over the pie.